I found a guy on Flickr who took race photographs back in the 70s and I asked him if he would take a look at my pictures. He thinks it's the November 1974 race in Ontario, CA. It matches up, I think. In that particular race Richard Petty blew an engine. You can see him coming down pit road in a smoking car below. Also, that race was won by Bobby Allison and this car taking a reverse victory lap appears to be Bobby's red, white and blue Matador. If he is right then we have in the picture below Bobby Allison, A.J. 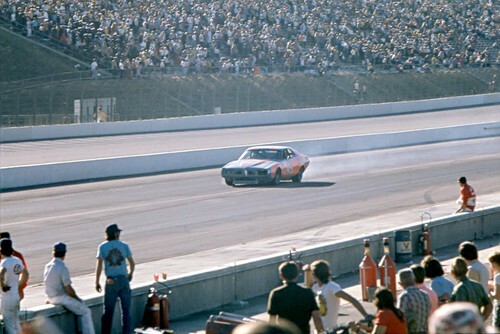 Foyt and Richard Petty nose to tail. How cool is that? The Flickr user that helped me out was this guy. I love the internet hive mind. I received three responses on my quest. One from a former NASCAR writer for the Charlotte Observer. That was really cool, he wrote about racing for a long time and has an a great blog where he publishes stories about his years on the circuit. 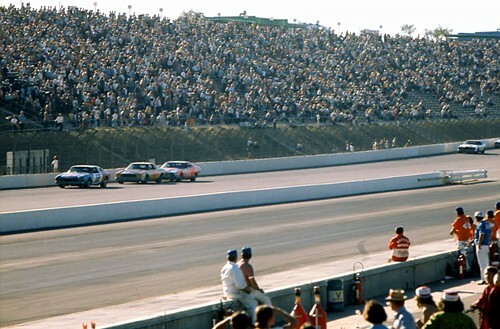 As a race fan that moved to Charlotte in the 90s I treasure accounts of days before I even knew what NASCAR was. 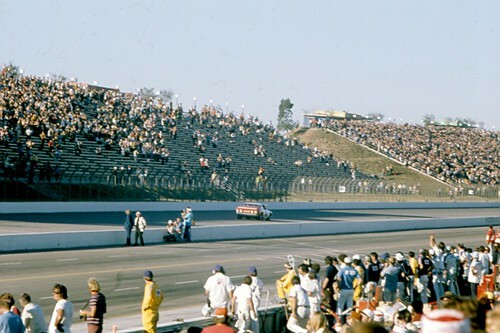 I really wish sometimes I grew up in Charlotte and had spent my childhood and teen years going to races in the 70s and 80s.